Excelsior Crew (Left to Right) Back Row: Eduardo, Angel, Marco, Jose, Alejandro, Max, Juan M., J.J., Roberto (The Big Guy), Juan E., Pablo. Front Row: Rogelio, Raul, Carlos, Victor, Arturo. Thank you for considering Excelsior Roofing Co. for your re-roofing project. Excelsior Roofing Co. is San Francisco’s oldest roofing firm. We have been family owned and operated since 1906. Mark Powers has been an employee since 1972 and became owner in 1983, the same year Excelsior Roofing Co. incorporated. An active foreman is on site, overseeing all jobs. Mark Powers inspects most jobs on a daily basis. We are proud to represent a Union shop that employs, on average, fifteen men, all members of Roofers Union Local 40 S.F.. All our men have obtained, or are undergoing, a three year State approved apprenticeship training program. We also are active in keeping current with safety practices and standards. All materials used are of high quality, which are stored in our warehouse, bought and paid for prior to re-roofing your property. We are proud to be members and supporters of the following roofing associations: Associated Roofing Contractors of the Bay Area Counties, Western States Roofing Contractors Association, The National Roofing Contractors Association, and the Better Business Bureau. Excelsior Roofing Co. has been featured by local television and newspaper publications. We remain available to all press, television and radio. We are an 80% residential, 20% commercial re-roofing company. We are considered experts in leak detection and try to take a common sense, rather than an aggressive, approach to roofing problems. Many items in the following pages are meant to be helpful to the customer regarding questions and concerns. If the homeowner accepts the bid, a proper and formal contract (per California State Contractors License Board) will be sent. A deposit may be required (not to exceed $1,000 or 10 percent of the contract price, whichever is less), usually $500. Click here to request a free online quote, or for a quicker response, please call our office at: 415-822-4488. Mark Powers been with Excelsior Roofing Co. since 1972. My day to day job is returning all phone calls, setting up all jobs, communicating with foreman every morning, ordering all material, all questions that arise prior, during, and after any job. Any negotiating for insurance and all the legal business related items are handled by Mark. Mark feels that anybody who hires Excelsior Roofing Co. is getting the absolute best of what San Francisco has to offer. We are without a doubt experts in our craft, which can also include problem-solving. Due to our longevity, we have distinct opinions about what you’re best options should be. We welcome the opportunity to serve you. Bill Powers began working on roofs with his Father and Brothers during summers in his high school years. Bill has worked with Excelsior Roofing Co. full time since 1979. He has worked in every facet of the business, from apprentice roofer to journeyman roofer, crew foreman and job estimator. Bill has been a member of Roofers Union Local 40 for over 30 years. Bill is very sharp and will look at your entire roof, letting you know what you need and don’t need. Eduardo started roofing in 2003 for other company’s and was hired by Excelsior Roofing in 2006. He completed his Union training in 2008. He has worked full time on the roof since 2006 and this year, as Mark starts to slow down, he brings expert assistance to all facets of Excelsior. His daily duties are supplying needed items to individual crews, estimating, problem-solving and assisting customers with their many concerns and needs. He also is acquiring all permits for us and has brought some higher tech to the business which is helpful to all. Rebecca has been a part of Excelsior Roofing all her life, but she took on all administrative tasks in March 2016 after having her first child, also Mark Powers’ first grandchild, Charlotte. After a career as a legal assistant and case manager for a top tier law firm, Rebecca brought her stellar office skills here to manage the bookkeeping, estimates, contracts and general administration tasks. It is due to Rebecca’s efficiency and organization skills that we are able to get your information to you so quickly. Our crew has been with us on average 20, 10, and 5 years. Our newest roofer has been here five years. 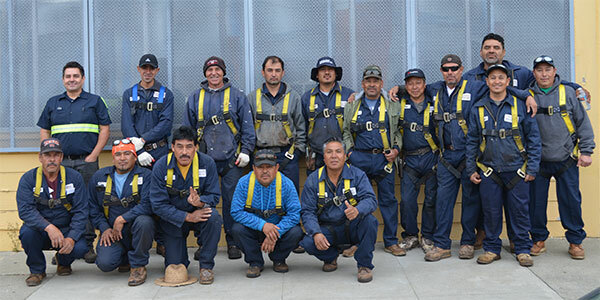 We have two foremen, Marco and Rogelio, and all the rest our journeyman. All are members are in good standing with Local 40. We can average between 12 and 15 men depending on the demand. All have completed a state approved apprentice training program. All participate in weekly tailgate meetings and on occasion certain specific training.